The 35th Canadian Parliament was in session from January 17, 1994, until April 27, 1997. The membership was set by the 1993 federal election on October 25, 1993, and it changed only somewhat due to resignations and by-elections until it was dissolved prior to the 1997 election. * Party only held official party status in the Senate. 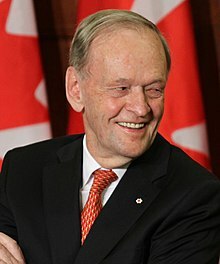 Jean Chrétien was Prime Minister during the 35th Canadian Parliament. It was controlled by a Liberal Party majority under Prime Minister Jean Chrétien and the 26th Canadian Ministry. The Official Opposition was the Bloc Québécois, led first by Lucien Bouchard, then by Michel Gauthier, and finally by Gilles Duceppe. The Speaker was Gilbert Parent. See also list of Canadian electoral districts 1987–96 for a list of the ridings in this parliament. Members of the House of Commons in the 35th parliament arranged by province. * Brian Tobin left parliament in 1996 to become premier of Newfoundland; Gerry Byrne was elected to replace him in a by-election. ** Bill Rompkey was appointed to the Senate in September 1995; Lawrence O'Brien was elected to replace him in a by-election in 1996. * Gaston Péloquin died in a car accident in 1994, and was replaced by Denis Paradis in a by-election on February 13, 1995. ** Lucien Bouchard left parliament in 1995 to become premier of Quebec; Stéphan Tremblay is elected to replace him in a by-election. *** André Ouellet was appointed head of Canada Post, and was replaced by Pierre Pettigrew in a by-election on March 25, 1996. **** David Berger was appointed Canadian Ambassador to Israel and high commissioner to Cyprus in 1994, and was replaced by Lucienne Robillard in a by-election on February 13, 1995. ***** Shirley Maheu was appointed to the Senate, and was replaced by Stéphane Dion also in a by-election on March 26, 1996. * Dennis Mills quit the Liberal caucus to sit as an Independent Liberal in May 1996, but returned to the party in August of the same year. ** Roy MacLaren was appointed High Commissioner of Canada to the United Kingdom, and his seat was filled by Roy Cullen in a by-election in 1996. *** Jag Bhaduria was expelled from the Liberal Party for falsifying his credentials. **** Jean-Robert Gauthier was appointed to the Senate in 1994, and replaced by Mauril Bélanger in a by-election in 1995. ***** John Nunziata was expelled from the Liberal Party for voting against the 1996 budget on April 16 of that year, and sat for the rest of the session as an Independent. * Jan Brown was suspended from the Reform Party, and then quit the party to sit as an Independent Reform member. ^ Members of the Canadian Senate are appointed by the Governor General on the advice of the Prime Minister and remain as Senators until the age of 75, even if the House of Commons has been dissolved or an election has been called. Government of Canada. "26th Ministry". Guide to Canadian Ministries since Confederation. Privy Council Office. Retrieved 2006-11-09. Government of Canada. "35th Parliament". Members of the House of Commons: 1867 to Date: By Parliament. Library of Parliament. Archived from the original on 2006-12-20. Retrieved 2006-11-30. Government of Canada. "Duration of Sessions". Library of Parliament. Retrieved 2006-05-12. Government of Canada. "General Elections". Library of Parliament. Archived from the original on 2006-05-04. Retrieved 2006-05-12. Government of Canada. "Key Dates for each Parliament". Library of Parliament. Archived from the original on 2005-09-14. Retrieved 2006-05-12. Government of Canada. "Leaders of the Opposition in the House of Commons". Library of Parliament. Archived from the original on 2007-03-11. Retrieved 2006-05-12. Government of Canada. "Party Standings (1974 to date): At the Senate". Library of Parliament. Retrieved 2007-04-24. Government of Canada. "Prime Ministers of Canada". Library of Parliament. Archived from the original on 27 April 2006. Retrieved 2006-05-12. Government of Canada. "Speakers". Library of Parliament. Archived from the original on 2006-09-17. Retrieved 2006-05-12.